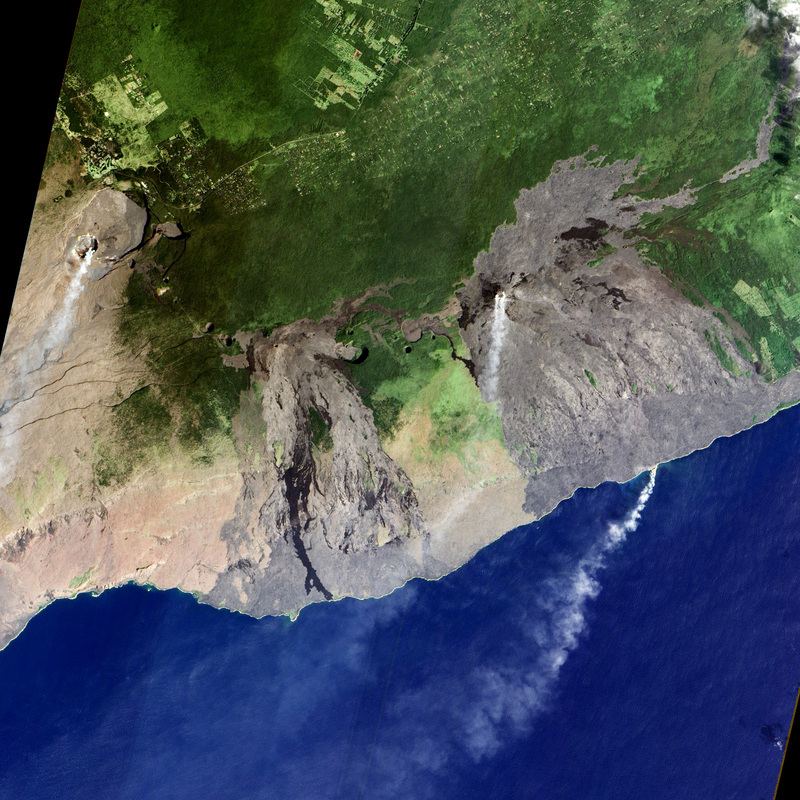 The Pu‘u ‘Ō‘ō eruption of Kilauea, the most active volcano in the Hawaiian island chain, has been going on almost continuously for more than three decades. 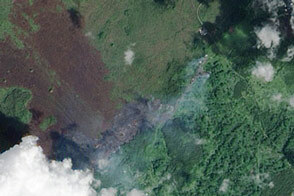 The location and intensity of lava flows have varied over the years. An individual episode can fluctuate too, sometimes making a glowing appearance at the surface and other times staying hidden from view in sub-surface lava tubes. On occasions when the lava enters the ocean, the event makes a spectacular show of island-building. But it’s not every day that lava meets the sea. 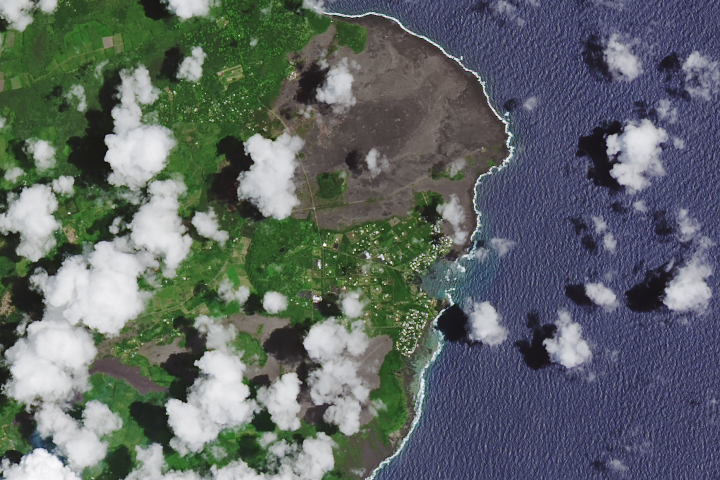 The last time a flow from Kilauea poured into the Pacific was 2013. 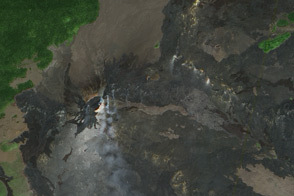 The most recent episode stems from the “61g” flow, which started during an eruption in May 2016, progressed down the flank of the mountain, and has been flowing into the sea since late July. 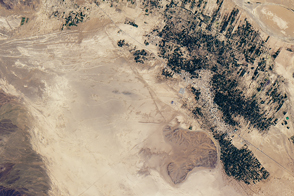 The Advanced Land Imager (ALI) on NASA’s Earth Observing-1 satellite acquired this natural-color image of the event on November 13, 2016. 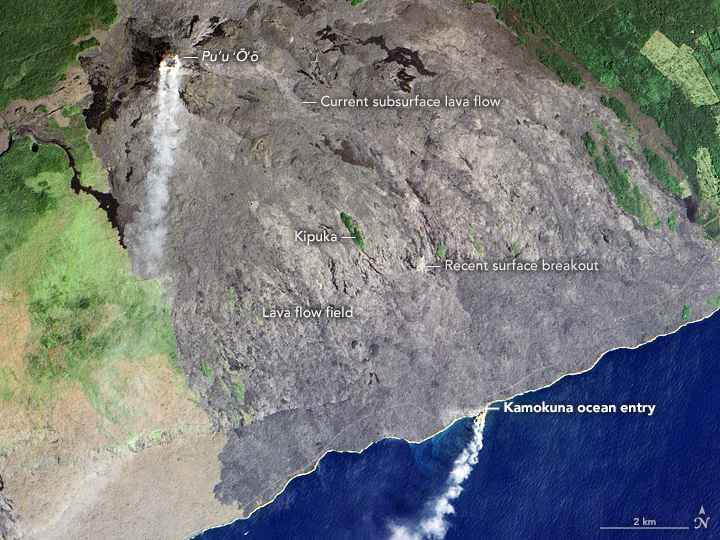 The gray areas in the image show nearly the entire flow field, including lava that has accumulated since 1983. 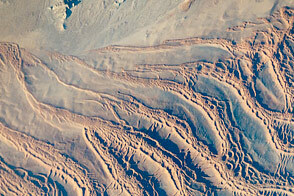 The active flow in this image starts at a vent just east of the Pu‘u ‘Ō‘ō crater. Ground-based research suggests that it moves southeast and southward through lava tubes below the surface. The active flow might be hidden from view in this image, but breakouts have sporadically appeared at the surface in the past few months. 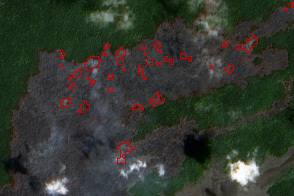 The signature of a recent surface breakout is the lighter gray area at the base of the pali (cliff). 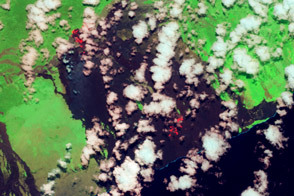 A false-color image from the same day shows that this area is still warmer than usual; so too are the crater and the land where lava enters the sea. Molten rock meets the sea in the latest episode in a long-lived eruption. The Atlantic (2016, August 29) Lava Flows From Hawaii's K?lauea Volcano. Accessed November 18, 2016. National Park Service (2016) Hawai‘i Volcanoes National Park. Accessed November 18, 2016. USGS Fact Sheet (2004, December 2) Viewing Lava Safely - Common Sense is Not Enough. Accessed November 18, 2016. USGS Hawaiian Volcano Observatory (2016, November 18) Recent Kilauea Status Reports, Updates, and Information Releases. Accessed November 18, 2016. USGS Hawaiian Volcano Observatory (2016, November 13) Satellite image shows no surface breakouts on flow field. Accessed November 18, 2016.